From this tutorial you’ll learn how to utilize Download Button JetElements module style for Elementor. 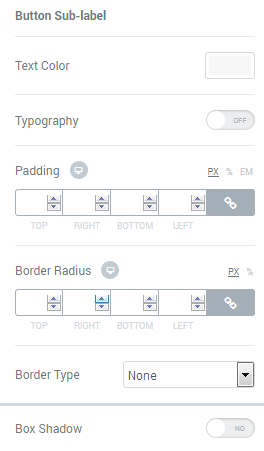 In this block, you can change style and appearance settings for Download Button module, define item padding, alignment, additional elements color, etc. Icon Size — here you can set the necessary icon size to use it for the button. Icon Color — use color picker tool to choose the needed icon color. Download Link Icon — use the dropdown menu to specify the position of the download link. Alignment — select the centered, left or right alignment of the button. Icon Margin — here you can define the preferable margin values for the button icon. Background Type — in this block you can choose, whether you want to use classic or gradient type for the button. The customization options vary for each type. Color — here you can set background color for the button using color picker tool. Text Color — here you can select the preferable color of the button label text using color picker. Size — define the font size of the button label. Family — here you can set the font family for the button label. Style — in this block you can choose from the dropdown menu the style of the font. It can be normal, italic (the characters look similar to handwriting) and oblique (the characters are slightly inclined to the right). Text Color — here you can select the preferable color of the button sub label text using color picker. Typography — turn the option on to view the typography settings. They are similar to those in the Button Label block. Padding — here you can set the preferable custom padding for the whole column where the module is displayed. Fill in the values for the top, bottom, right and left padding in pixels to apply your custom padding.